The Elusive Collection is an icon of true rarity. These are very special limited editions, each presented in a unique way. 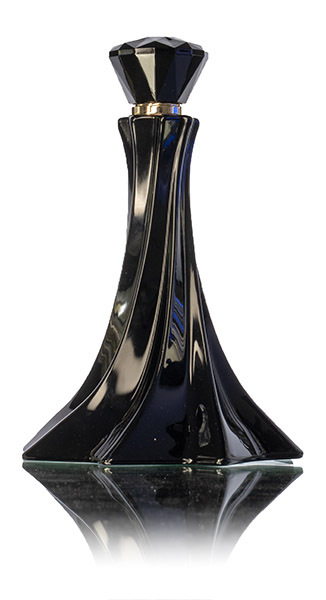 Presented in unique black crystal flacons, produced by an ancient process which involves heating the crystal to 2200 degrees centigrade in order to achieve the black colour, and each weighing 1.2kg. Only 100 of these will be produced, to be filled with your choice of perfume. Each owner of a Black Opera flacon will be entitled to one refill per year for three years at no extra cost. Each is made to order with a lead time of about 3 weeks. As the name suggests, it is soft, warm and rich. This perfume has all the glamour of Elegantes London. This stylish scent is a blend of bergamot, apple and linden blossom. It leads with dewy lily of the valley and elegant rose at the heart and finishes with the well-balanced notes of amber, patchouli and sandalwood. Look no further for the perfect special occasion perfume. Rose and musk are the heart of this elegant perfume. Cinnamon provides a spice note, and rich Moroccan rose is delicately complemented with a citrus orange flower. At the base, musk is accompanied by vanilla bean to add a creamy softness. Elegant, exotic and the perfect nod to Oriental Empire.